DC comics has rebooted… Yet again. After the lukewarm reception of 2012’s the new 52, DC tried a minor retooling with DC now, but that was received even worse than the new 52. This time Dc: Rebirth promised to give fans what they wanted. An old school flavor, with a modern edge. They would finally embrace their character’s rich history. Geoff Johns was tasked with this endevour and for the most part it succeeds. I would say that reading Justice League’s : Darkseid War, story arc would provide further context but the story does work as a stand alone introduction of what’s to come. But at the low price of 80 pages for 2.99, you can’t go wrong. Essentially Rebirth tries to tie up all the past reboots by explaining them away as one particular reason. Someone or something, has shifted time and changed things so often that no one in the current DC universe remembers there was ever another timeline, let alone relationships, or people. 10 years have basically become unaccounted for by the bulk of the DC universe, save for one person. ( SPOILER) Wally West. Yes, Wally has returned to the DC universe after a lengthy absence, and he seems to be on a mission to warn everyone of a disturbance in the timeline. Wally goes from place to place and person to person in an attempt to give them the news but in order to have enough time he needs a tether to this universe. The problem is no one seems to recognize him and thus no one can save him and give him a proper chance to explain things. There’s a great scene between Wally and Barry Allen that is the climax of this point. One of the main plot points is, just who or what is responsible for these time altering events? The answer is hinted at at the end of the comic. I say hinted because, it’s still unclear how everything connects yet, but needless to say it was surprising. I don’t want to spoil it because I think it’s a great moment to discover on your own. Aside from the main plot thread, several other things are touched on. None the least being the true origin of the Joker and the death of the new 52’s Superman. 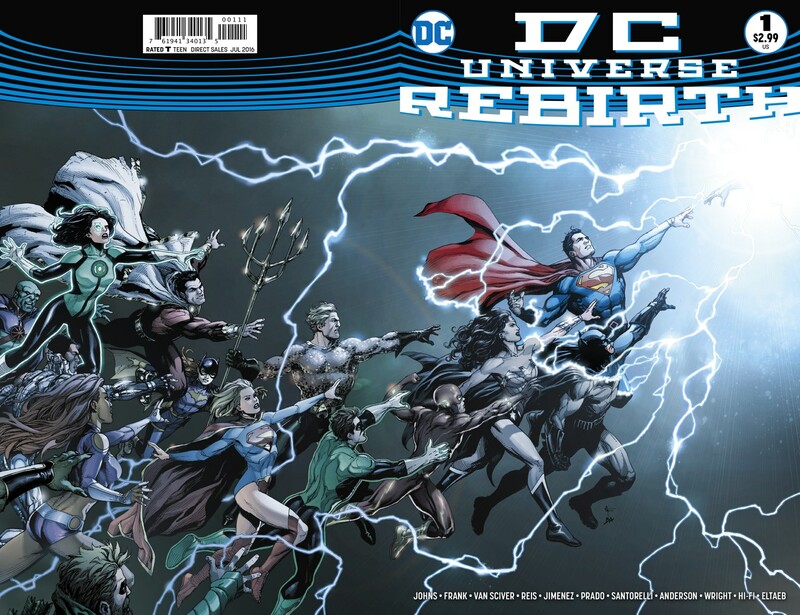 DC: Rebirth is a clear labor of love for Geoff Johns. He has a deep affinity for these characters and understands how to bring out the best in in even the most obscure one. In the hands of a lesser writer the convoluted plot could seem too daunting to the reader, but thanks to Geoff Johns approach you appreciate the characters first. You become willing to commit to the big story ideas he presents once you’re willing to go along for the ride. Major points have to go for the sheer creativity it takes to craft such an all encompassing story, not to mention the fact of the immense pressure on this reboot to succeed. I will say that you do need to pay attention as it is not an easy read. It’s not on a crazy-Grant Morrison level, but it is complex. Of the highest quality is the best way to put it. The cream of the crop show up for this 80 page saga. Ivan Reis, Ethan Van Sciver, Gary Frank & Joe Prado each get a chance to shine on this book. Every panel is rendered with exquisite detail. The colors shine through and complement the fine inks. It almost seems fitting that there is more than one artist, as it goes well with the theme of many different universes and timelines. However, each style is not different enough to be a distraction either. We’re not talking about going from a Jim Lee style to a Bruce Timm style, nothing like that. I would say that Ethan Van Schiver has the fewest pages ( which isn’t a surprise knowing his history of delays) and Gary Frank has the most pages of art. DC comics had to something to keep up with Marvel’s current surge in popularity and readership. It’s pretty evident that DC is behind in the movie game but they can’t afford to be behind in comics as well. Having another reboot so soon after the last one was a huge risk. DC had to know that just the very notion of having another reboot would piss off fans, and I think a lot of them are. There is a disillusionment among almost all DC fans at this point. We hope and want, a product worthy of our fandom without cheap gimmicks. Having Geoff Johns’s name attached to this reboot is for many, a step in the right direction. I personally have a lot of trust in Johns and this issue does nothing to disprove that. It’s a strong multi-layered story with fabulous art that provides the new foundation of the DC universe. The ending of this issues will no doubt divide fans. I’m on the fence myself. It could prove very interesting OR a very bad idea. Will the other books out there reflect the quality of this book, let alone be on the same page in terms of continuity? Only time will tell. At the very least, the future looks just a bit brighter for DC.